In 1845, the Navy returned Fort Norfolk to the War Department. 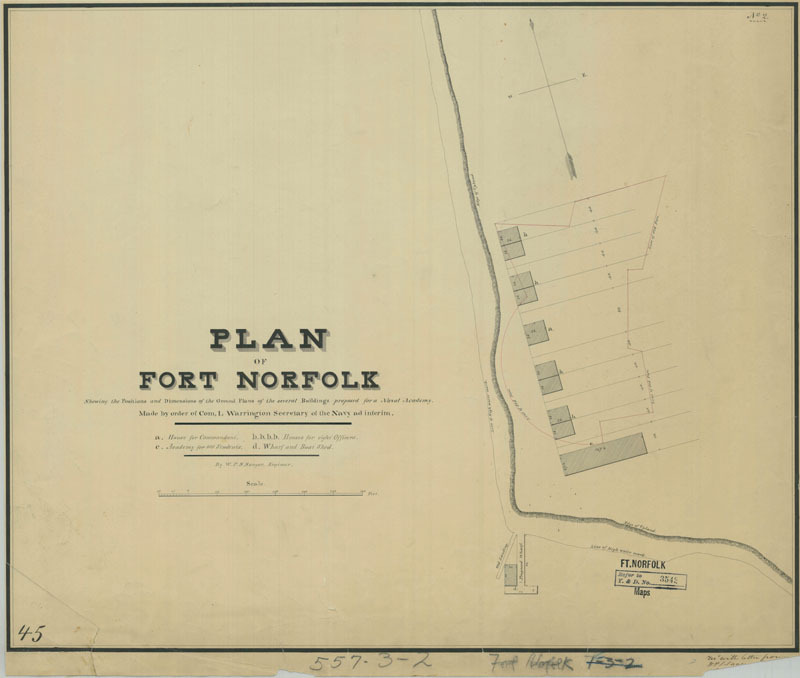 Sometime between 1845 and 1849, the Navy contemplated leveling a portion of the earthworks and all the existing buildings at Fort Norfolk and establishing a "naval academy" on the property. The proposal never passed the planning stage. There is no specific mention of the proposed naval academy in the Quartermaster General's correspondence nor that of the Navy's Bureau of Yards and Docks. The Navy's plans were probably scuttled because of the War Department’s insistence in 1848 that the long abandoned fort was still "necessary for the defense of Norfolk." The Secretary of War had apparently offered to loan the fort to the Navy only on condition that the fortifications could be put into use on short notice (OQMG Wilkinson to Bancroft, December 13, 1845; Smith to Preston September 6, 1849). W. P. S. Sanger, the same engineer who produced the 1844 rendering of Fort Norfolk noted above, drew up a plan for the academy (Sanger ca. 1848) (see above). Sanger's drawing indicates that the facility was designed to accommodate 400 students along with a commandant and a faculty of eight naval officers. Six new buildings were to be constructed along with a new wharf and boat shed (see above). The fact that Sanger superimposed the proposed academy buildings on the existing earthworks indicates the Navy’s intent to demolish a part of the fort and its existing buildings. No further documentation on the proposed naval academy was located during the research for this project.